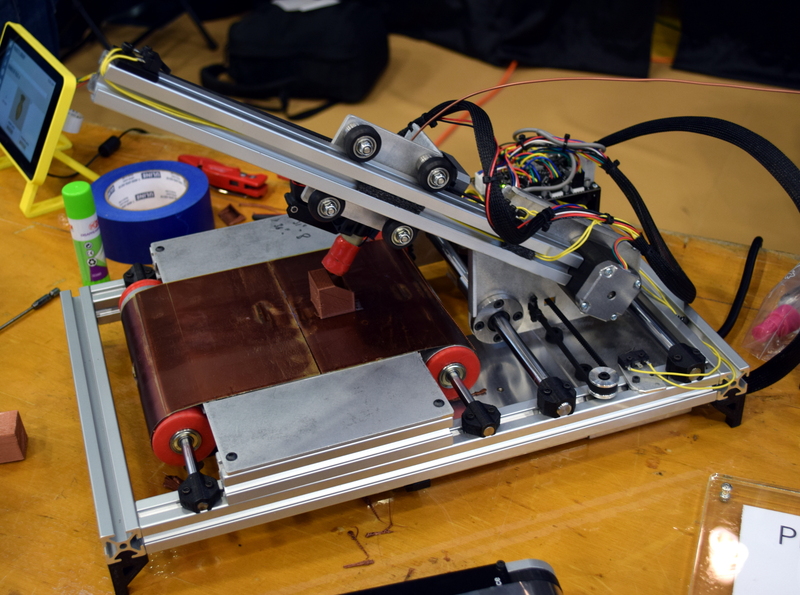 One of the more interesting homebuilt printers on display was a Freedom Evo 75 “Liquid Handling Robot” that was converted into a large format 3D printer by [Paul Paukstelis]. Originally this machine would have cost as much as a car, but it was rescued from the scrap heap and got a new lease on life with the addition of some new electronics. Each axis has an Arduino Pro Micro controlling a DC servo motor with coupled rotary encoder, which interestingly enough was inspired by something he read here on Hackaday. This printer had a number of neat features, such as using motor stall detection in place of endstops in all three dimensions. [Paul] was also eager to show off the benefits of the closed loop control system: yanking on the hotend and pulling it away from the print, only to have it automatically return where it was supposed to be. This wasn’t the first time PrintrBot CEO [Brook Drumm] showed off the his infinite build volume printer, but it was finally the version of the machine that us volume-challenged peons could purchase. It’s a very different looking beast than what he showed off at MRRF earlier in the year, more targeted to the DIY hacker than those looking for a turn-key experience. Which is probably for the best, as this is the kind of cutting edge 3D printing that is arguably not ready for the masses. [Brook] had the finalized Printrbelt up and running, churning out an endless supply of little bronze cubes. But it did need the occasional helping hand. Parts didn’t always cleanly fall off the edge of the belt, and the first layer seemed to need readjusting every few prints. No show stoppers, but clearly the technology is still in the early stages. If desktop 3D printing is niche, then machines like the Printrbelt are ultra niche. But we don’t doubt that there are people out there who are extremely interested in the idea of owning their very own production line. If you’re brave enough, kit and assembled versions of the Printrbelt are available now. [Kuntry 3D] was there showing off his 3D printer that’s actually made of printed extrusion. He wanted to see if it was possible to simply take a 3D printer design based around aluminum extrusion and replace it all with 3D printed facsimiles, and the results were very impressive to say the least. While we wouldn’t suggest you print the extrusion for your next build, we can’t deny the fact that you could. Of course we’ve heard of similar machines in the past, but it’s always nice to see one of these projects chugging away in the real world. In an interesting example of old meets new, ERRF held a 3D printed version of the classic “pinewood derby” race. The official Boy Scouts of America rules were adapted where appropriate, and the computer-controlled track and timing system were standard derby gear. While there were strict limits on things like wheelbase and length, the designs of the racers varied wildly: from slick aerodynamic wedges to fully finished and painted models. As you might expect considering it was being held at something as nerdy as a 3D printing festival, a number of the racers sported some rather unconventional looks. It wouldn’t be much of a 3D printing festival without tables full of incredible prints, and ERRF certainly didn’t disappoint. Here are just a few of the prints on display that made us realize just how much better some of these folks are at this than we are. Nobody in attendance would call the first ERRF anything but a success, but of course nothing is perfect. We heard a few grumbles about the venue itself. Some didn’t like the policies on outside food and attendees with miniature hackers in tow lamented the fact that strollers weren’t allowed in the building. It was also obvious that more than a few vendors and exhibitors bailed on the event at the last minute: empty tables with name cards on them were hard to miss. Despite the few glitches, the show really couldn’t have gone much better. 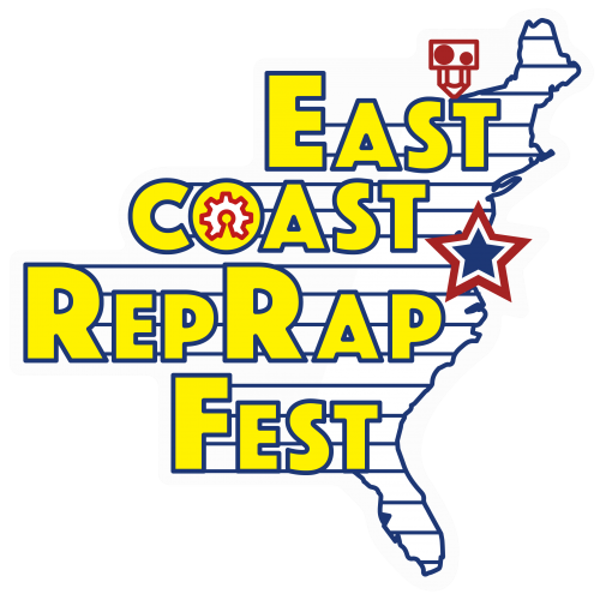 We’re eager to see what the future looks like for the East Coast RepRap Festival. Tropical paradise indeed. At least Maryland should be more comfortable (and picturesque). Can’t the midwest have anything?!?! Yeah, Imme be pissed if this cannibalizes MRRF. Looks like printrbot is no more? Went to find info about the printrbelt and main page states they’re now closed due to low sales. Just saw that today as well.